Are you looking for an easy fusion recipe for the weekend BBQ? Well then you will love this quick and easy to remember, 4 ingredient marinade! I simply combine these with the chicken in a zip lock bag, shake the closed bag, and let it take care of itself in the refrigerator. Come time to grill, I put the chicken on the grill and discard the marinade with the bag. Easy clean up too. And come time to eat (my favorite time), the result is a succulent tandoori flavored chicken, laced with honey, ginger and lime! The sweetness of the honey is just the perfect balance for the tandoori masala, ginger and lime! I brushed them with a touch of ghee and honey, just as they came off the grill- to enhance the flavor as you take your first bite! Yum! 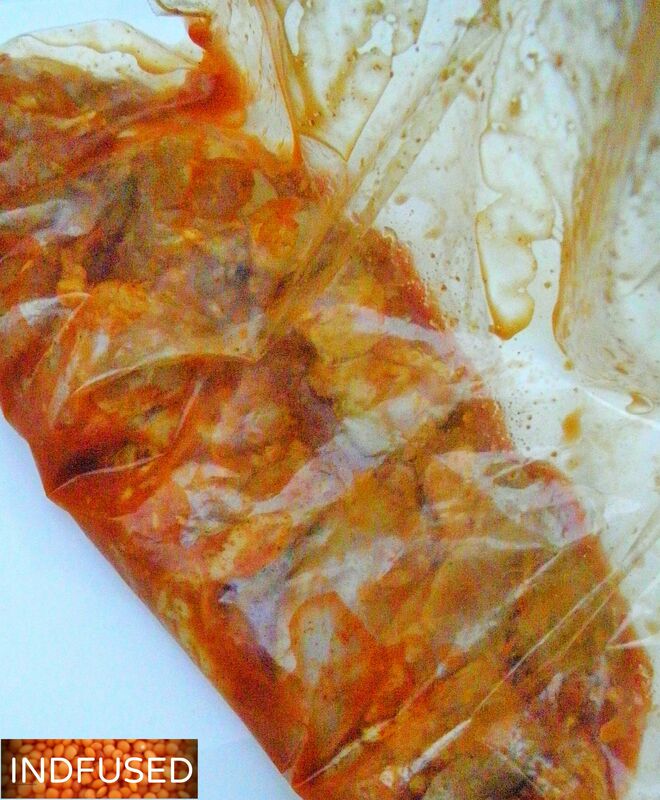 In a zip lock bag, combine the chicken with all ingredients for the marinade. Close bag, and shake it so all the chicken pieces are covered with the marinade. Let the chicken marinate in the refrigerator for a minimum of 30 minutes. Grill the chicken about 3 to 4 minutes on each side or until cooked. Baste with the ghee and honey mixture and serve with a salad such as the beetroot and pear koshimbir, the watermelon pizza salad with curried quinoa or the masala papad salad cones! This marinade could work with tofu. Hope to try it soon. Greg , what a great idea! Do let me know how you like it with tofu! Thanks Greg! What a great idea to use it with tofu! Thank you Swapna. Do let me know how you like it. Thank you Antonia. It is a very simple and easy marinade but makes a flavorful chicken! Reading this blog makes me so hungry! Another great recipe to try, thanks very much! Gorgeous Sandhya, I can only imagine what these flavors impart. I like the sweet and hot coming through in this recipe. Are you suffering from a heat wave too? This would be excellent on the barbeque when you do not want your kitchen extra hot! Lovely! Loretta, thanks so much for your kind compliments! Yes it is in the 90s here so this chicken on the grill with a salad was what I made for dinner! Thank you Madiha for your sweet comment! Thanks Roy. I hope your sister likes it! I’ll take seconds 🙂 It looks great. Thank you Sandhya, it is indeed very simple! I think I will cook tandoori chicken tonight! yum! Let me know how you like it, Indah! Love it! I can’t believe it was so easy to make! I added chilli powder 😁😁😁 Thank you for awesome recipe! Indah, I added some chili powder to mine too 🙂 I usually keep it a little tamer for people not so used to spicy food. I am so glad you liked it! 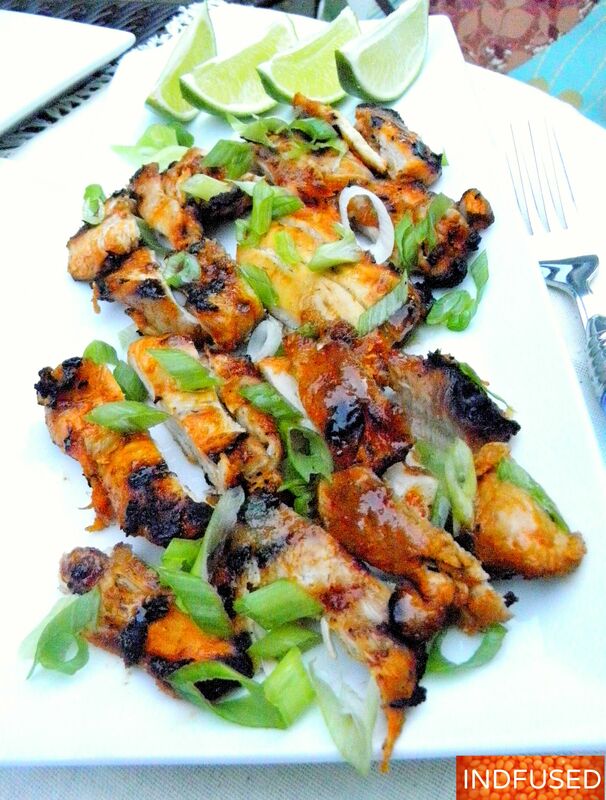 Cannot wait to try your Tandoori Honey Lime chicken next time we barbecue. Looks so good! I love the marination recipe dear. Too good and delicious. Thank you Robin for your sweet comment. Thank you so much Jen! Truly appreciate the kind words and the shout out! A great recipe of tandoori chicken, clicks are so attractive. surely non veg lovers will go mad over it.